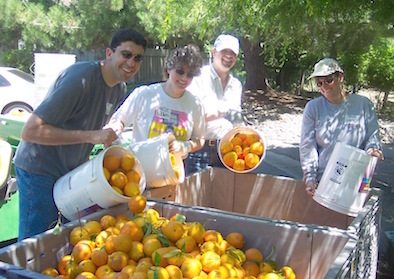 Village Harvest is a nonprofit volunteer organization in the greater San Francisco Bay Area which harvests fruit from backyards and small orchards to help people in need in our community. We help people share the abundance of their gardens and their talents to build a healthier community for all. Your extra fruit can make a meaningful difference for the 1 in 10 people in our community who need healthy food. Don't let your fruit go to waste or become a mess! Visit our Harvesting page for information on how you can offer your extra fruit for possible harvesting by Village Harvest volunteers, or pick yourself and donate to an organization near you. Have fun while making a difference for thousands in the community! Our harvests are filled with abundant fruit, grateful tree owners, and the community spirit of over 1,000 people who volunteer every year. Sign up through the Events calendar or learn more in the Volunteers section. We have Resources to help people in the San Francisco Bay Area and elsewhere. Find information on fruit tree care, gardening, making preserves, and recipes; learn how and where you can donate fruit or produce; or find harvesting and gleaning organizations in communities in the US and Canada. Our biggest harvest ever continues Sat. April 27!